Time for the best caffeine fix you’ve ever had before you even get out of the shower. Twist off the top of our new little jar of coffee scrub (go ahead, we dare you). Inhale deep. Mmm. The decadent scent of a dark, roast-y cup o’ joe. Instant relaxation. But, those beans are about to do so much more. Smooth a palmful of coffee scrub all over your skin, rubbing in gentle circles. 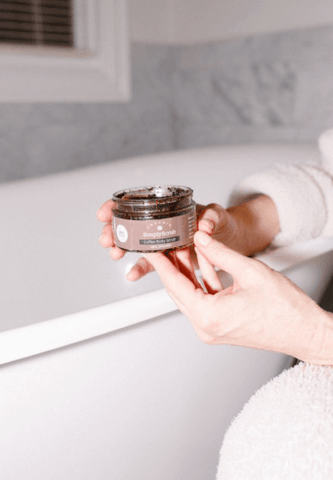 The grounds (plus a few dashes of brown sugar and dead sea mineral salt) will slough off any dead skin, leaving you looking smoother, brighter, and younger. Combined with tea tree oil to fight off bacteria and shea butter and honeycomb to help seal in moisture, and you’ve got a whole lot of happy in a portable little package.